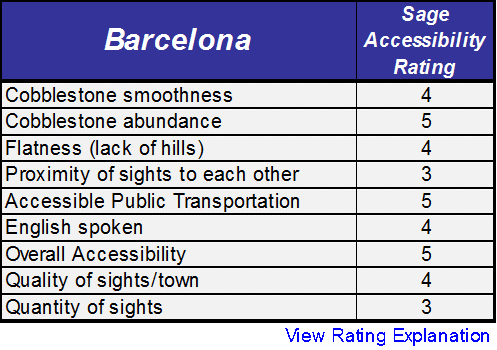 Home »Disabled Travel Newsletter »How Accessible is Barcelona? 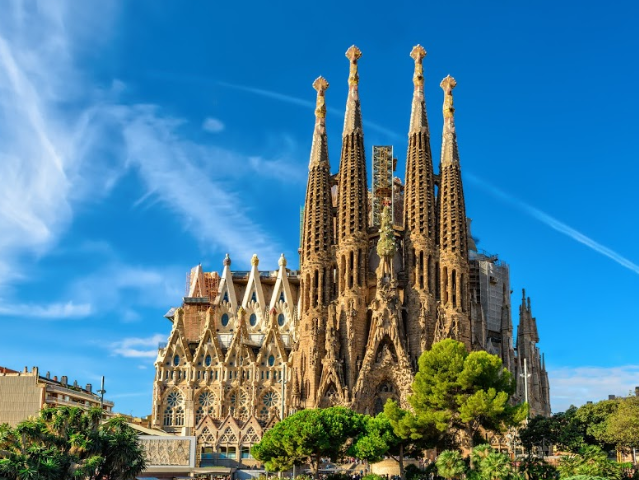 Whether it’s the jumping off point for your Mediterranean cruise or your sole destination, Barcelona has enough accessible sightseeing, accessible beaches, and accessible natural beauty that disabled visitors will want to come back again and again. 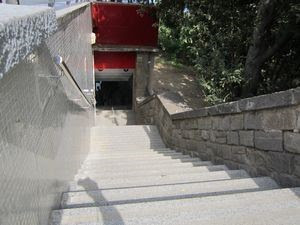 Barcelona disabled access is better than most cities in Europe. I gave it a 5 Star Sage Accessibility Rating which is my highest rating. One of the most cobblestone-free medieval quarters – Many European cities are built around a medieval city center, and Barcelona is no exception. However, unlike Paris, Bruges, Siena, and Istanbul, Barcelona has very few cobblestones. Wheelchair users will have a much smoother ride here! Wheelchair accessible paths at the beach – Barcelona disabled beach access is some of the best I’ve encountered anywhere in Europe. There are ramps to get from the sidewalk down to the sand, wooden paths to get to the water and beach wheelchairs are available to rent. Many modern hotels with good accessibility – Accessible hotels in central Paris are housed in 200 year old buildings, and few have been made fully accessible. In Barcelona, that’s not the case! 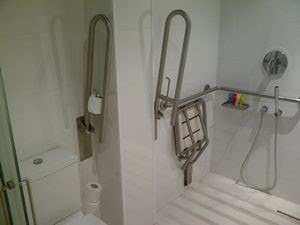 Many accessible Barcelona hotels (even in the city center) use modern buildings with flat access at the entrance and roll-in showers. Disabled travelers will have numerous accessible hotels to choose from in Barcelona! Many accessible cruises leave from here – Cruising is one of my favorite ways to travel and it’s one of the most accessible ways to vacation! Many wheelchair accessible Mediterranean cruisesdepart from Barcelona which makes this a great city to visit for 2 or 3 days before heading out to sea! Barcelona’s gondola is not accessible – Barcelona’s gondola from Montjuic Hill to the harbor offers great views but unfortunately it has steps a both the harbor end and the Montjuic end (see photo below). Long tourist lines – Just like any other city in Europe, lines can be very long to get into the main attractions. In Barcelona, this is particularly true at Sagrada Familia and the Picasso Museum. If a few cruise ships are in port at the same time, the waits can take hours. The best way to avoid this is by booking an accessible Barcelona guided tour with skip-the-line tickets included. Tourist attractions are not within walking distance – Many of the tourist attractions are located inside or near the Gothic Quarter but several require transportation to reach. Gaudi’s Park Guell is over 4 km away from the Gothic Quarter. It is not too late to book your accessible Barcelona trip for this fall or next spring! Take advantage of the cheaper hotel rates in October, November, January and February, or enjoy the magic of the holidays in Barcelona! We enjoyed our trip immensely and had very few snags. The hotel was a good choice for us- the staff and its location were great. The airport transfer was first rate. Our driver for both trips and couldn’t have given us better service. Our two guided tours were also excellent. The driver was understanding and most helpful with John’s chair. Our guide gave us a great intro to the city and it really helped us navigate on our own. I’d recommend the Gothic area over the Ramblas. It’s safer, less chaotic and has more Barcelona charm. Many thanks for your guidance in the planning.